Here you will find antique terms beginning with E covering everything from Earthenware to Escapement and enamel to Exeter plus many more that you might find useful. Architect and furniture designer who alongwith eero saarinen, explored the potential of new materials such as plywood, aluminium and steel. Developed his knowledge of plywood moulding during the second world war, and later used the technique to create furniture, chairs tables, screens and storage units, that were fluid, light and strong. A product made form clay that is only fired to the paint at which the particles form a single mass but do not vitrify into a glassy, impermeable substance. The resulting body is porous and a glaze is required to make it waterproof. Becasuse of the low firing temperatures glazes earthenware can take a wide range of metal oxide colouring agents and is often brightly decorated. A group of western trading companies that opened up trade with the far east countries, including India and china in the 15thC. The portuguese were the first europeans to start the long distance trade, followed by the british, french, dutch and then the USA. The british east india company, was set up in 1601 to trade for spices and flourished for more than 200 years, by importing and exporting furniture, carpets, silk, embroidery and porcelain. Architect and furniture designer associated with the art furniture movement c1870 to 1890. The American dry plate camera manufacturer who introduced the Kodak camera in 1888, It was the first camera designed to use a flexible roll film. The film was a roll of paper coated with a light sensitive emulsion. A French cabinet maker who specialised in veneering. A technique known in ancient civilisations and revived in the early 17thC. The word ebenist was coined as most of the 17thC. French furniture used an ebony veneer. A hard black material produced by heating rubber with sulphur. Used to simulate jet in jewellery and for some early fountain pens. Also know as vulcanite. A close textured hardwood which is black in colour. Ebony is resistant to decay although, it is brittle. From the 17thC in Britain it was thinly cut as a veneer and used for banding and inlay decoration. Other woods such as fruitwoods were stained black or ebonised to imitate ebony and are much more common than the real thing. Coromandel is similar in colour and weight but it is mottled grey or brown or striped with black and yellow. Calamander is a light brown ebony mottled and striped with black that was popular for regency veneers and banding. 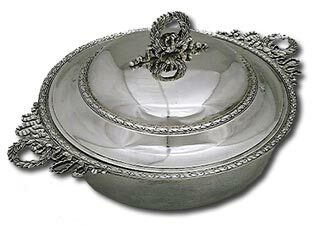 The french term for a late 17th and 18th century lidded bowl with two handles made in silver, pewter or ceramic. Generally used for serving soup. Porringer in English. Silver versions are sometimes known as equelles. A non-profit workshop established in 1912, which until 1940 produced large commissioned tapestry scenes. After 1946 smaller coarser weave panels designed by contemporary artists were more typical. Also known as the dovecot studios or dovecot tapestries. An arts and crafts movement furniture designer and in 1881 the author of the influential publication ‘The decoration and furniture of town houses’. A fragile and extremely delicate chinese porcelain from the early 18thC. It was later produced by irish belleek porcelain and the japanese kutani factories in the late 19th and early 20th centuries. A fine black stoneware produced in staffordshire from c1710, that could be polished to a shine. Wedgwood basalte ware (picture right) is more refined. Egyptian architecture, symbols and hieroglyphics proved popular after napoleons invasion of Egypt in 1797, and were incorporated into the work of neo-classical designers and architects as decorative motifs. The early 19thC furniture designs of english designer and collector thomas hope helped introduce egyptian taste to Britain. Clocks that are driven by electricity. First produced in britain by alexander bain in the 1840’s, the clocks fall have three main categories; — free pendulum clocks in which the pendulum receives an electric impulse to maintain momemtum. Synchronous clocks, regulated by the alternating current of mains electricity. A form of decoration applied to meatlware. The method of plating metal by an electrolytic process. The best known of which are those of silver and chromium. Silver plating replaced the sheffield plate process in the mid-19thC. The process was first patented in sheffield in 1840 and nickel silver was soon found to be the most successful base for electroplating; and should be marked EPNS (electro plated nickel silver). Copper and britannia metal (EPBM) were also used. Unlike sheffield plate the silver deposited in the electroplating process is free of all impurities and the end product is a colder, less mellow metallic colour. A method of decorating by cutting fine lines or dots into a glass, metal or other hard surface . In acid engraving or acid etching, the subject to be decorated is coated with an acid-resistant wax, varnish or gum, and the design incised through this with a fine steel point. Alternatively, areas to remain in relief are coated with the acid-resistant substance, leaving the background exposed. The object is immersed in acid which ‘eats away’ the exposed areas. Depth and texture are achieved by adjusting the time of exposure to the acid. The process was used to decorate late 15thC armour, and from the 16thC, mainly developed as a printing process. See cameo glass. Wheel engraving is believed to date from c. 1500 bc, but the technique flourished in Europe from the 16thC. The surface to be decorated is held over a treadle-operated rotating wheel fitted with an abrasive disc and a pattern is ground into the surface. The method can create shallow surface engraving, or deeper cameo and intaglio effects. Also – A print made from an inked steel or copper plate into which a design has been cut. Part of the mechanism in a clock or watch that controls the driving force (either a weight or a spring) and allows it to ‘escape’ at regular intervals. This counteracts the tendencies of both an unchecked weight to accelerate and a spring to weaken on unwinding. The verge escapement was introduced with the first mechanical clocks. It was originally used with an oscillating bar or foliot with weights at either end, and after the introduction of portable clocks and watches c. 1520, with a balance wheel. The anchor or recoil escapement, invented c. 1670, operates in association with a pendulum; it replaced the verge escapement in longcase clocks some 15 years after their introduction, but was not used in bracket clocks until c. 1800. The motion of a seconds hand linked to an anchor escapement is characterised by a very slight backward movement (or recoil) after each forward movement. The deadbeat escapement, in use by 1715, was also for pendulum clocks. It evolved from the anchor escapement, but the second hand stops dead after each forward motion. The lever escapement, an adaptation of the deadbeat invented in 1754, is used with a balance wheel. 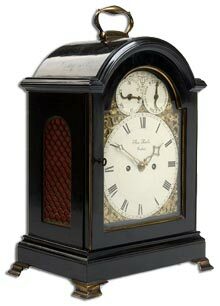 From c1820 it was used increasingly for watches and carriage clocks. The duplex escapement, also for balance-wheel mechanisms, has either two escape wheels or, more often, a single escape wheel with two sets of teeth. It was perfected c.1750 and used for high-grade watches and carriage clocks 1750-1850. The detent or chronometer escapement is used with a balance wheel, and incorporates a detent, or locking device, of either spring or pivoted form, which alternately locks and unlocks the escape wheel. Developed from the mid- 18thC and widely used in the 19thC, it proved one of the most accurate escapements of all. The method of plating metal by an electrolytic process. The best known electroplated articles are those of silver and chromium. The former replaced the sheffield plate process in the mid-19thC. The process was first patented in Sheffield in 1840. nickel silver was soon found to be the most successful base for electroplating; it may be marked EPNS (electroplated nickel silver). Copper and britannia metal (EPBM) were also used. Unlike Sheffield plate, the silver deposited in the electroplating process is free of all impurities, and the end products tend to be a colder, less mellow metallic colour. A refinement of the electroplating process in which silver-plated articles are reproduced from moulds. A mould is used as one of the electrodes in an electroplating vat, and by electrolysis is lined – more thickly than in straightforward electroplating – with the silver. The mould is then freed to leave a hollow shell in the shape of the finished article. Introduced in 1843, electro-typing was expensive but accurate, good for making exact copies of complex metalwork and prompting a mid- 19thC interest in naturalistic decoration on silverware. Birmingham-based metalworking firm, whose proprietor George Elkington (1801-65) patented the first silver electroplating process in 1840. From then on, the firm concentrated on electroplating and electrotyping, leasing out the patent to other silversmiths, and on producing tableware and presentation pieces by Christopher dresser and other designers. Master clock-maker to King George III, who developed a form of compensated pendulum and improved the cylinder escapement. His father and his son, both called John, were also notable clock-makers in their own right. Pottery produced from 1881 by English art potter Sir Edmund Elton (1846-1940) at his family home in Somerset. Elton, a follower of the aesthetic movement, was influenced by Far Eastern, South American and European art. Decorative Eltonware vases, jugs and bowls use various coloured slips and lustre, lead, metallic or monochrome glazes. The means of producing a relief design, on metal or leather for example, by hammering on the reverse side of the material. Objects such as pots and tankards are embossed with a long-handled, dome-headed snarling-iron. On silverware, embossing is used for the basic, large-scale relief shapes in a design, and finer detail is added by repousse and chasing techniques . One of the rarest and most valuable precious stones, depending on highly variable quality. Emeralds range in colour from pale to dark green, the most valuable being dark green with brilliance and clarity. Flawless stones are extremely rare. Enamel colours are made out of powdered glass and pigmented metallic oxides such as gold, copper and manganese suspended in an oily medium. This can be painted onto glass or ceramic objects, and during firing, the oily medium burns away and the other materials fuse together. In enamelware, coloured enamel pastes are applied to a metal body by various techniques and then fired. basse-taille (low relief) enamelling, First introduced in 14th century Italy. A cut relief, a design cut into a metal plate at various depths, is filled with translucent enamel, creating a 3-dimensional effect. The deeper the reservoir cut in the metal, the darker the color, with nearly transparent color possible in very shallow cuts. This technique allows for very subtle shading. cloisonne enamelling is accomplished by adding thin metal strips or wire to the surface of a metal object to create small cells (cloisons). These cells are either filled with molten glass or with powdered glass that is kiln fired. This technique was developed in Egypt before 1800 BC, although the name cloisonne was not applied until the eighteenth century. Cloisonne enamel is the easiest of all types of techniques to identify, as the metal wires are easily recognised. painted enamel: In which two or more colors of enamel are painted on top of one another. 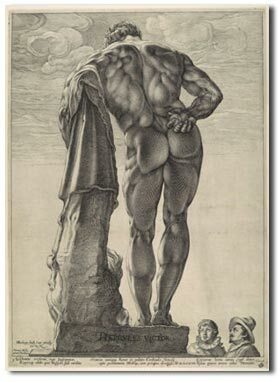 (The black, white and grey version of this technique is called grisaille). This style of enamelling was first popularized about 1600. Although the white base enamel for this type of work is a true vitreous enamel, the subsequent layers of color are raw oxides or metal mixtures. guilloche: In this form of enamelling, the metal surface is engraved with intricate circular patterns or waved lines. Translucent enamel covers this engine turning and creates a beautiful effect with dark and light lines caused by the varied depths of the plain and engraved surfaces. Very popular in Victorian and Edwardian jewelry, Guilloche enamelled pieces are easy to identify by the wavy lines usually seen under the glassy surface. The enamel is frequently further decorated with designs (especially floral motifs) painted on the surface. plique a jour: Probably the most difficult of all enamel types to master. Plique a jour enamel begins with a lattice or framework of wires similar to that used in closoinne, but with no metal background attached. When filled with transparent or translucent enamel, the finished object resembles stained glass. This enamelling technique was used frequently by the most skilled jewelers and enamellists of the Art Nouveau period. cold enamels: Resins, plastics, or paints may be applied to jewelry and decorative objects to produce an enamelled effect, but they share none of the techniques or composition of vitreous enamel. They create a lot of color for a minimal cost, but, materials are less durable than true enamel. Because they require less skill and expense than glass enamel, they have traditionally been used on costume jewelry, including some sterling silver pieces. Engraved decoration on metal and other materials, of circles, waves or narrow grooves, produced on a lathe. Shallow silver or sheffield plate serving dish with or without a cover, made in Britain from c.1760. Military shoulder strap often fringed with gold braid. such as fruit or sweetmeat dishes and condiment holders. Epergnes came to Britain from France c. 1715; the name is from the French épargner (to save), the idea being that dinner guests were saved the trouble of passing dishes. Type of plastic designed to imitate tortoiseshell and used to make fashion accessories such as hair clips in the early 1900s. London-based silversmith who worked in partnership with her brother-in-law, William Ernes. Following his death in 1808, she formed a partnership with her business manager, Edward Barnard, and went on to produce numerous items including tea and coffee services, epergnes and tankards. A term for a carved shield on a pediment. Also – any protective metal plate on furniture, particularly a keyhole plate. Also – A small metal name plate on a clock face or a firearm. Maker’s mark – name, initials or monogram – stamped on French furniture during the second half of the 18thC. The mark was struck with an iron stamp and appears in intaglio. A late 18thC offshoot of neoclassicism introduced by architect-designer Robert Adam, c1774. 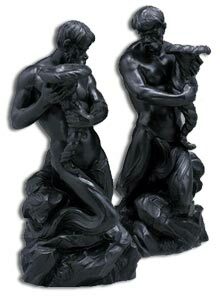 Many of Adam’s designs were ostensibly based on the architecture, art and ornament of the ancient Italian country of Etruria (now Tuscany and Umbria). The use of boldly contrasting black, white and terracotta was typical of his interiors but the colour scheme was in fact taken from Greek pottery. The area sometimes left free below the design on a circular coin, often used for the date, artist’s initials or a small design feature. Woollen carpets made in Exeter, Devon, in the mid-18thC using Turkish knot. Exeter carpets were among the earliest to be made in Britain, their elaborate designs based on Savonnerie patterns, with Rococo scrolls, floral motifs and foliage.